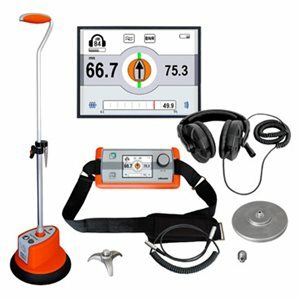 The Digiphone plus pinpoints underground cable faults with unprecedented accuracy and sets a new standard by applying innovative audio concepts. This combination results in a pinpointing device for high resistive faults that is unsurpassed in sensitivity. Digiphone plus works off the “thunder and lightning principle” of fault location. In the same way you can measure how far away a storm is by counting the distant between a faster lightning flash and its slower thunder, this pinpointer works by measuring the energy around an underground fault. If you think of the flashover at a fault as the lightning, the Digiphone measures distance by figuring timing between that electromagnetic “flash” and the seismic (or acoustic) jolt also created at the moment of flashover.